Saturday morning and the sun has gone in. There were a couple of days last week you could have persuaded yourself that summer was here. Of course I spent those days sat at my desk in an office and the summer was seen second hand through a thick layer of glass. But it was clear that the sun was shining and those bits of the Mersey I could see turned silver in the light and the sky was clear and a flat blue. Today the temperature has dropped and the sky is grey and heavy. Thundery rain is predicted. There has already been a shower last night and outside the grass is slick with wet. At least I won’t need to worry about watering the garden over the weekend. It had started to cloud over last night but it was dry so I found time to light up the small barbeque to cook a couple of steaks. Because there wasn’t much time I put them on the barbeque too early. They cooked fine but the coals then reached their optimum heat twenty minutes after we had finished eating them. 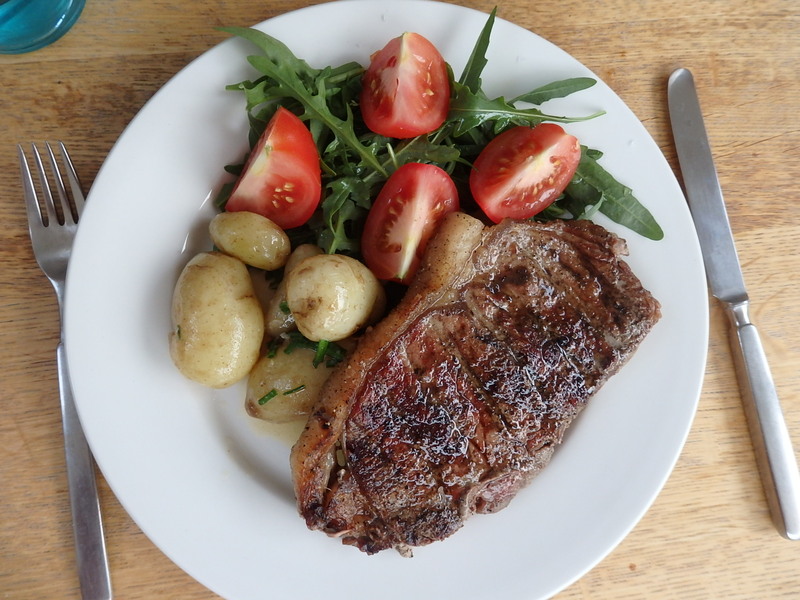 We had the with Royal Jersey potatoes and rocket from the garden. Listening to Rocket from the Crypt. Double turbo charged mindless rock’n’roll mayhem. Perfect for a Friday evening. And now half an hour later some of the grey clouds are moving and there is a hint of blue sky and sun in the garden.